The Wild Place at Children’s Museum in Easton was the result of a Community Visioning Charette facilitated by the professional landscape design team from COG Design, Waltham, MA. Participants included staff, parents, community members, board members, and education professionals. The concept was then refined to create a final design which met standards for beauty and visual clarity as well as developmental appropriateness, educational criteria and safety, which the Museum team required. Although beauty is said “to be in the eye of the beholder”, the audience and community response to the space has validated the design’s impact. Further proof of the attractiveness of the space is demonstrated by the fact that no vandalism has occurred in the seven years that the Wild Place has been open. The community response has been overwhelmingly positive to this beautiful, natural space. The outdoor learning center consists of several themed gardens, including an African Garden, Butterfly Garden, Dinosaur Garden, Herb/Kitchen Garden, and Fairy Garden. Clearly delineated activity areas have been included in each, with spaces divided by changing surface materials and borders. Each area is either identified by simple, directive signage such as “create, explore, dig, listen” or with easy to identify visual clues. Children are naturally drawn to the center of the space where they run, tumble, jump and skip. A large, rustic, cedar gazebo, stage and amphitheater make up the gathering space and visitors meet there for performances and presentations. Staff and parents can see every area in a glance and the parents’ security concerns are allayed by an attractive fence that encloses the entire property. Special “hiding nooks” of tall grasses and sheer fabric give children the illusion of privacy while still providing clear visual access. The WILD PLACE uses a very diverse mix of natural materials. The main structures, including the entry feature, gazebo, butterfly lookout and treehouse are all built of rustic red cedar in an Adirondack style. Native plants with interesting leaves and flowers are used in all of the planting beds, and non-natural materials are only used when absolutely necessary for durability and/or safety. Durability and low maintenance are critical components of all the children’s museum and garden exhibit designs. The potential for a tremendous number of visitors must be planned for right from the start. From its beginning, The WILD PLACE has been an important and inspiring addition to the Children’s Museum’s exhibits and a major motivating factor in the development of programs for families. 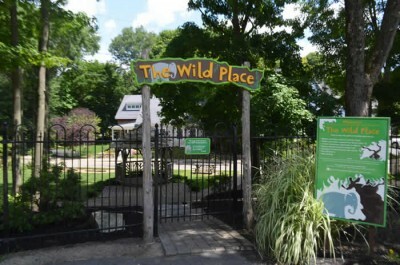 The WILD PLACE opened with a major special event – the Spring Fling! This event celebrated the spring equinox, the opening of the Wild Place and offered a great diversity of nature crafts and games. Each summer since opening in 2006, a series of drop-in days are held in the Wild Place and feature 16 themed days of nature, science and healthy living activities, crafts and games as well as performances and programs by experienced science and nature professionals. A variety of extremely popular animal programs are held each year. Professional presenters include Curious Creatures, New England Reptile and Raptor, Farm Visits, and Miss Candy’s Petting Zoo. These programs, ranging from beekeeping, local owls, hawks and vultures to farm animals to more exotic creatures like chinchillas, snakes, spiders, showcase animals and their habitats. Examples of other programming include Garden Stones, which allows children the chance to collect nature treasures and preserve them as a unique keepsake for their own yard and PBS Science Day, which offers soil and sand activities inspired by books and PBS children’s programming. Seasonal craft programs and workshops are held, using natural materials as inspiration. Though The Wild Place was the collective product of many individuals and organizations, it would likely never have happened without the vision, passion and persistence of the Museum’s Co-Founder and Executive Director, Paula Peterson Hutcheson. Paula’s love of the outdoors and her understanding of the ways in which this special place could become a natural learning environment, was the ‘engine’ that brought it to life and led to its certification. Her dedication to outdoor learning has continued to provide “growth spurts” that have seen the addition of butterfly gardens, artistic exploration pods and paleo exploration pits through the ensuing years. Now retired, Paula returns to The Wild Place to curate and shepherd its sustained development. And her passion for nature and growing things has her embarking on becoming a master gardener in the years ahead.